Also check out our March Madness giveaway for a chance to win an Axiom Epic Grand Master 500 speaker system. That magical time of year is almost upon us. Soon enough, you’ll spend countless hours staring at a bracket that holds your fate and watching an endless rotation of college basketball. Yes, March Madness is almost here, and if you aren’t totally prepared the fast-paced tournament will be gone before you know it. 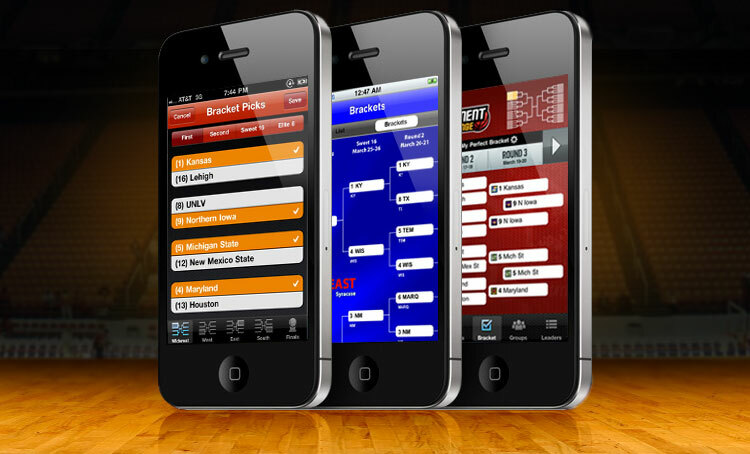 Between Selection Sunday and the National Championship on April 4, devotees will be hard-pressed to fit as many games and trash talk into The Big Dance as possible, and these apps can make it easier. From keeping constant tabs on your bracket’s success and catching video highlights to lording your victories over Facebook friends, these March Madness apps will keep you digital up to date on all things college basketball throughout the tournament. Don’t miss any of the action when you’re on the move with CBS’ March Madness on Demand App. You can catch every game with free live streaming video and keep track of your bracket at the same time. The apps also allows you to plug in your TV provider and it will bring up where each games is on across the four networks that cover the tournament (TBS, TNT, CBS, and truTV). Do you enjoy the tournament but really get your kicks rubbing a rival’s face in your bracket’s success? There’s an app for that. 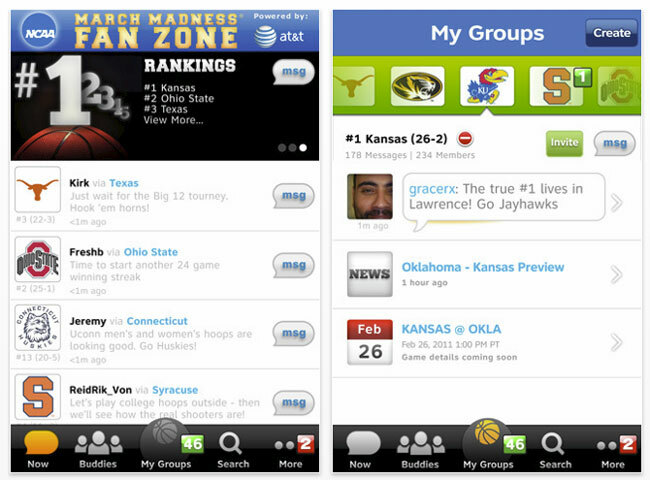 Fan Zone provides scores, news, and rankings, but is more social than most of the other tournament apps out there. Making it that much easier to create a community around your bracket, and then mercilessly taunt (or be taunted by) them. 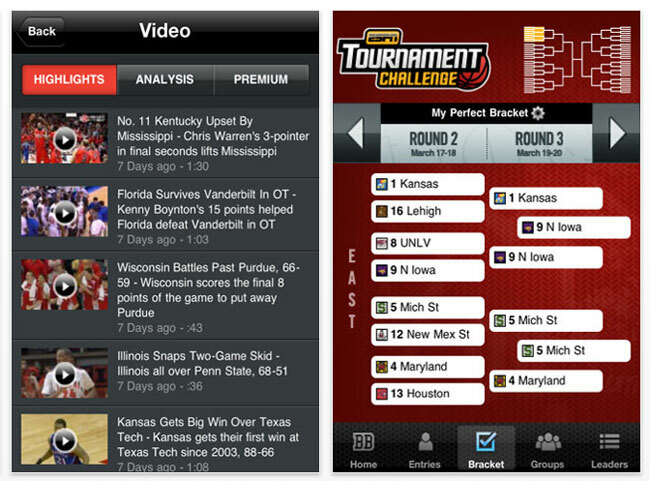 For the multitasking set: Get you bracket updates while simultaneously playing ESPN Tournament Challenge. This app offers standard fare like rankings, news, and schedules while also providing bonus features like Twitter integration for what little social interaction you can afford during March Madness and research that gives in-depth background on individual teams. 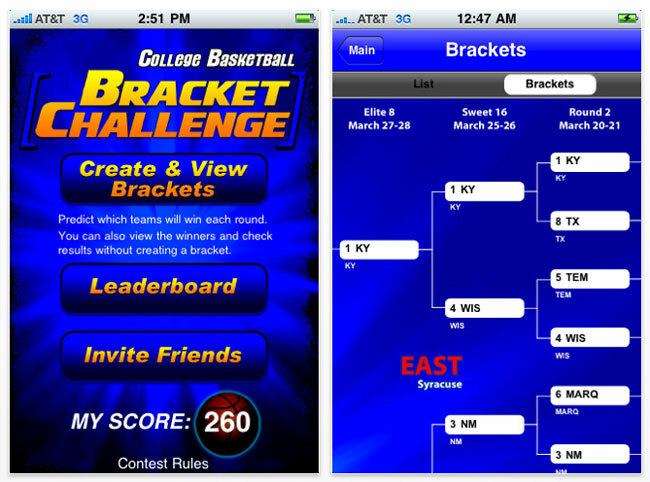 And of course, it also syncs with the most popular bracket game, Tournament Challenge. This bracket app keeps track of all your tournament standings while also adding refreshed social sharing integration. You can now brag about your bracket stats via e-mail, Facebook, or Twitter in one touch. 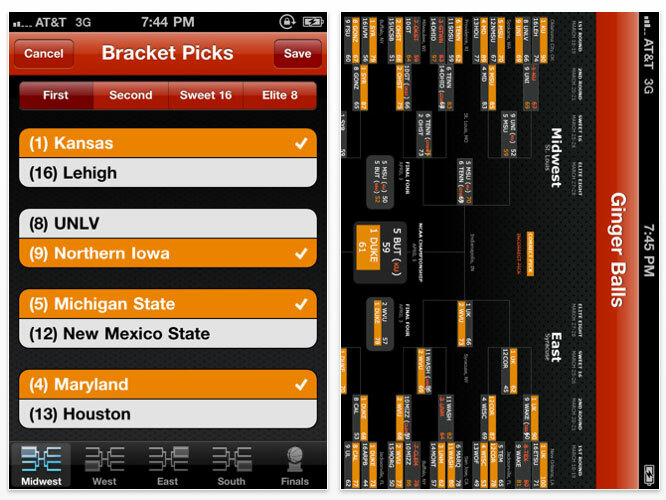 For those of you that don’t use ESPN or CBS and still want to track your bracket then this simple app does the trick. Just fill in your picks, finalize your bracket and you’re all set. If you already have a Slingbox at home then you’ll probably want to take the plunge for this spendy but very useful app. When connected to a Slingbox via 3G or Wi-Fi, the SlingPlayer app gives you the ability to play anything you can see on your TV on your iPhone or iPod touch. Not only can you watch all the games, but you can watch highlights and coverage of March Madness from the network of your choice. If you’re only interested in tracking scores and stats on your phone then you can’t go wrong with the best sports app out there, ESPN’s ScoreCenter. 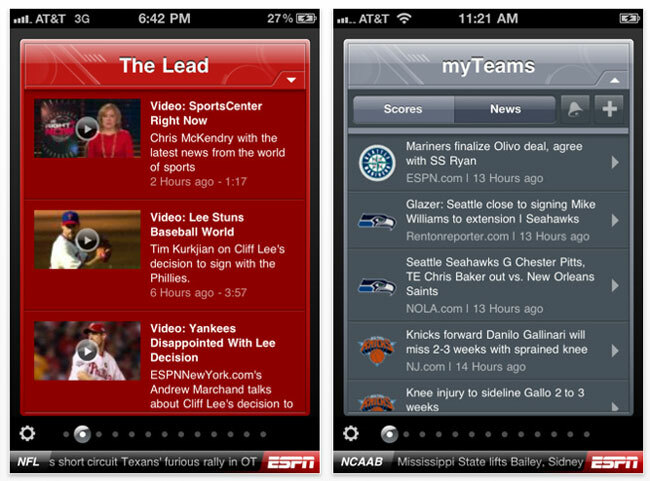 The ScoreCenter app gives you up to date scores, stats, summaries and more. The app also allows you to personalize your scoreboards to give your favorite teams more emphasis.